I interrupt your regularly scheduled giveaways to bring you Double Danger’s first garden blogger’s bloom day of 2010. By the way, come back tomorrow for our encore giveaway. Yes today was supposed to be the last day, but the sponsors have stepped up and you guys are going to be blown away! 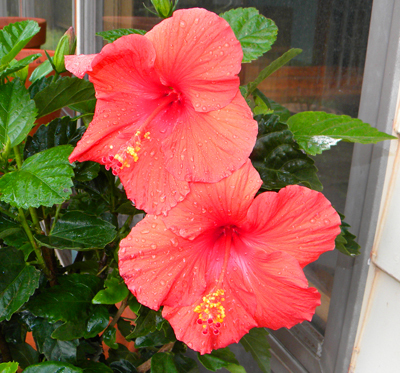 A couple of weeks ago I found a hibiscus that needed me. It was sad and thirsty and I just couldn’t stand not to bring one home with me. After some pruning and watering it really started perking up and has given us a couple of blooms over the past week, but today it put on its best show yet. Double blooms, Double Danger Blooms! As you can see there are rain drops on these guys. I stood out in the rain just to get this picture. That is dedication! If you are here for the giveaway, scroll down a bit more. You still have time to enter! And come back tomorrow for the encore giveaway!